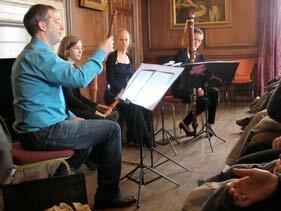 We have reported this annual event since its inception at Trinity College of Music in 2005. The Exhibition by instrument makers and publishers has become the largest such event world-wide, and this year we have concentrated on its spin-off, a programme of makers' demonstrations and recitals at Admirals House in the Old Naval College buildings, together with several master classes in the Peacock Room which are a regular feature of these weekends. Clavichords by Huw Saunders & Edmund Handy were demonstrated by David Griffel and John Irving [R], better known as fortepianist, who gave a dazzling Mozart recital incorporating his researches, published last month as Understanding Mozart's Piano Sonatas and reviewed by MP. Irving embellished freely the published text of some movements of K.330 and abandoned the spurious ending of the most popular Fantasia in favour of an improvised conclusion of his own; he is preparing for a recording of Mozart on clavichord next year. 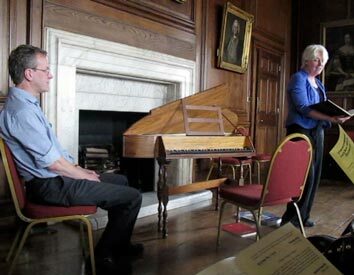 The woodpanelled concert room in Admirals House is a delightful venue, one in which any worries about clavichord being quiet for public performance vanished immediately. Several of the demonstration recitals were of instruments which I had previously passed by, but those events were revelatory. 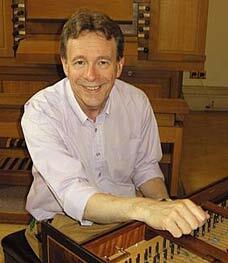 I had tended to think of the spinet as a cut-price make-do for the harpsichord, but the full and rich tone of Stephen Robinson's, demonstrated in English repertoire by his wife Rosemary, put me right. Listening to her sympathetic playing of music from Byrd via tercentenarist Arne to Herbert Howells for most of an hour, there was no feeling of anything missing. 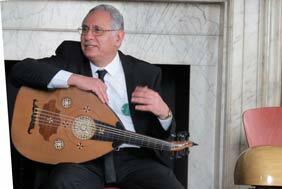 Michael Moussa enthralled us with the subtleties of the Oud; its seemingly monotonous music mostly accompanies singing. He demonstrated transitions and variations of moods through some of the Arabic scales; those few of us with absolute pitch would have been advantaged in following his illustrated analysis. He gave an amusing anecdote about how he was helped to bend bamboo strips by steaming instead of repeated failures by using flame in the traditional way. Everyone was bowled over by the beauty for ear and eye alike of the instruments which Moussa makes. Even more surprising to me was the variety and beauty of sound in Bill Taylor's traditional harps. 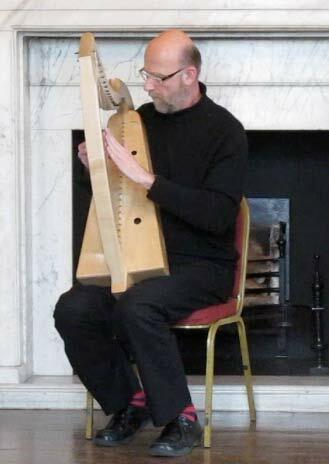 His exposition took us through gut-stringed medieval types, a wire-strung clarsach [illustrated L] whose tone continues until firmly damped, and a large renaissance "bray" harp - bray as in the donkey's - with a buzzing "sizzle" achieved with tiny wooden pegs called bray pins! These were demonstrated with consummate artistry by this renowned scholar-performer, and I have been pleased to follow up this new-found interest with some of Taylor's many CDs. I recommend one of them to all enquiring spirits; an entrancing disc of Medieval love poems from Japan and the Low Countries with newly composed wakas paired with late-medieval chansons, in which you'll hear the varied sounds of bray harp, wire-strung psaltery, medieval lute, organetto, recorders and soprano voice [Kattenberg KA003]. Delicious! During the festival Bill Taylor had also taken part in a demonstration of the reconstructed ancient Lyre of Ur at St Alphege Church. At a lunchtime recital there of Bach Family Music, John Henry and Steven Devine experimented with playing harpsichord and fortepiano in duo. Most successful was W F Bach's Concerto a Due Cembali in F.
For his demonstrations of Mollenhauer Recorders, Nik Tarasov was joined by three members of the QNG Recorder Quartet. Many new models were shown in their entertaining programme. On its first evening the festival had included a spectacular concert at St Alphege by the Quartet New Generation, who specialise in newly commissioned music for recorders [photo R by David Pape]. Do treat yourself to seeing and hearing them in action in Paul Moravec's Mortal Flesh, which demands quick changes of some thirty recorders in about four minutes; great fun, as was another newer novelty, Woiciech Blachaz's Airlines, which exploited all the "non-musical" sounds which are the basis of Helmut Lachenmann's music, but in a less serious mode; it is promised for a future recording. QNG CDs This enterprising group has issued two CDs, both ear-openers which should be obligatory purchases for anyone interested in the recorder and its future as well as the past. Both mix old and newest music, as is their policy. In accord with their contemporary image, they have a spectacular website full of splendid photos, including many of Greenwich. Click on and listen whilst you surf. 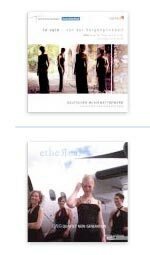 Their photoshoot for Ethereal [below, L] suggests that these ambitious young women may be the first recorder group to have a private jet ! For their next commercial recording, QNG should save up their pfennigs and produce it as a DVD; some of the pieces which we heard them play live are not so effective on the CDs. And it should definitely include Blachaz's Airlines. 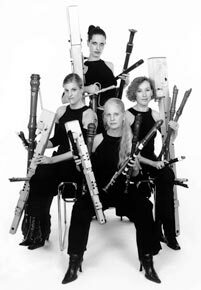 I trust that QNG Recorder Collective will be invited for residencies at British academies and music colleges to give masterclasses on contemporary recorder music. 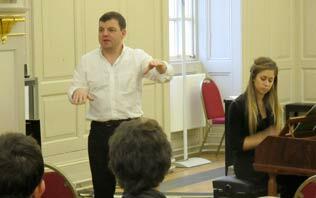 At this year's master classes in the over resonant Peacock Room, Rachel Brown on Baroque Flute made a wonderful complement to Wil Offermans' class last month, an inspiring visit in which extended possibilities for the modern flute were revealed. No such problems there for Steven Devine, a natural teacher who embraced the whole audience in his teaching. A gifted teacher with a strong voice, he has been Professor of Early Piano at Trinity for several years, but Piano Department students have been reluctant to come forward... 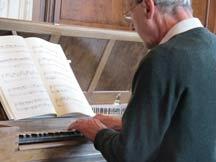 In his Introduction to the Fortepiano, listed as "a workshop and master class for aspiring fortepiano students", we were surprised that none of his morning's selected pupils had previously put hands on the totally different keyboard of Trinity's fortepiano. Concerts in the large Old Royal Naval College Chapel were seriously compromised by loud extraneous noise, presumably caused by the heating equipment, to which I have drawn attention repeatedly. It needs to be turned off for intimate music like Haydn à L'Anglaise unsuitably programmed by Café Mozart, and those chosen by Rachel Brown and Pernille Peterson on baroque flute and recorder respectively. 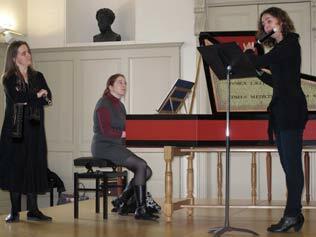 Pernille's Moeck Prizewinner's programme had three Castrucci sonatas from her CD (too many?) and of the novelties, those by Hosokawa and Rofelt were more successful than Christensen's Feuerspiegel for recorders (sometimes two in the mouth simultaneously) and accordion, a piece which had little fire and long overstayed its welcome. The Greenwich International Early Music Festival and Exhibition celebrates its 10th Anniversary with a fascinating programme of concerts, masterclasses, competitions, the world’s largest early music fair and a live broadcast from BBC Radio 3’s Early Music Show. The festival will feature performances from the biggest names on the early music scene including L'Arpeggiata, Red Priest and Pantagruel. - - The evening will end with a colourful Baroque Carnival as Red Priest perform music by Handel, Vivaldi and Telemann in the Old Royal Naval College Chapel (19.45-21.45). The extraordinary foursome - - breathe new life into early music with their endless vitality and devil-may-care attitude.- - . Experience a varied and inspirational programme of early recorder repertoire as performers from across Europe compete in the finals of the Moeck/SRP Solo Recorder Competition. The competition established in 1985 provides a crucial platform for aspiring recorder soloists.